This story was written and sent out to family as our 2015 Christmas Card. I guess it is a Christmas card to Fish=Food readers, too! Greg and I went on a Christmas Tree Expedition two weekends ago. When we are not fishing Greg works at the Port Townsend Shipwrights Coop. 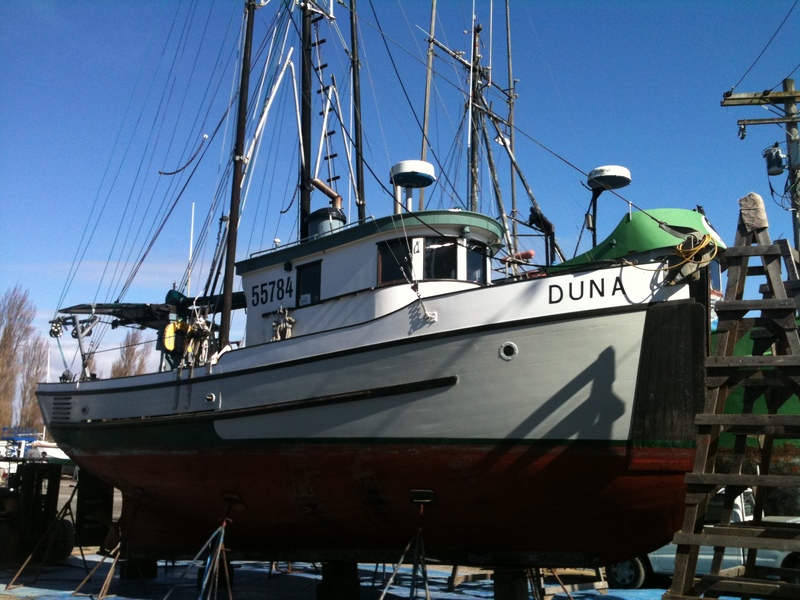 If he can’t be running a fishing boat, his second favorite thing to do is repair them. Each year the PT Shipwrights Coop picks a Saturday before Christmas to head for the hills and they invite any and all to come along. Mostly, it is Coop members and their families but other friends, many of them fishermen, often come along in search of a Christmas tree. We have been making this tree trip for at least 12 years now. Before heading up in to the Olympic National Forest to cut trees, we all meet in the morning at the Quilcene Forest Ranger Station, just 45 minutes from Port Townsend. To cut a tree legally you need to purchase a $5 permit from the ranger on duty. The permit comes with a zip tie so once the tree is down you can attach your permit tag to it. This year it was pouring down rain when we met at the ranger station but we were on a mission to slay trees so up we went into the forest, twelve cars and trucks in a row. Some years there are many more cars but the rain put off the less hearty. The road we take into the Olympic National Forest was originally a logging road. Down low it is paved but as the road snakes up into hills that become mountains, it turns to a dirt track. At 1300 feet/396 meters the rain turned to sleet. By 1400’/427m the sleet was snow! A friend in a truck pulled over and flagged Greg and me down to ask if we wanted to jump in his truck for the rest of the drive up hill? We could pick the car up on the way down, he said. I had confidence in the VW and said, “No, we’ll be fine” and we flew by into the snowy forest. I’m from Maine and this was just a dusting of fluff. As we climbed higher the snow was starting to pile up on the road and cover the trees all around us. Everyone had trucks, SUVs and four wheel drive cars, that is except for us in the mighty, mighty Jetta wagon. The people in the front of the line had fresh snow to drive on so they had great traction as the snow got deeper. But we were near the end of the line of cars and the snow had been packed down and slicked over by those who went before us. The road ahead of us was getting steeper and now the gentle curves were turning into sharp switchbacks. I had driven this road with ease in the VW multiple times in summer to access the Mount Townsend hiking trail but in the snow it seemed to be another place. Greg was looking a bit skeptical about my decision to proceed in the VW. I just looked at him and said, “don’t stop, honey, just keep going as long as you can!” If we stopped I feared that we wouldn’t have traction enough to get going again. We passed through an open area where the road was wide enough to turn around. Greg suggested we park and hitch a ride the rest of the way up. I was in the ‘just keep driving, don’t stop’ mode so I cheered him on and said, “we can do it!’ as I patted the dash of the car. As it would happen, we couldn’t. Shortly after my confident declaration, the wheels started spinning as they looked for traction and the car slid sideways in slow motion toward the steep drop off to the right. It was a bit heart stopping and I grabbed for the dash again but not to pat it. We got out of the car and went ‘hmmm.’ Luckily there was a car following us. MB and Peter piled out to check out the situation while their two little boys stayed in the car. Behind us down the road we could hear the rumble of something big and driven by diesel. We were relieved as we recognized the red truck coming at us to be that of our friend Gus who runs a tow company! Yup, just like Gus, he smiled, waved and threw snow all over us as he blasted by us and up the hill. Hmmm, again. While Greg drove the car MB, Peter and I pushed and up the hill Greg went without me. We had decided that if Greg could get going, he should just keep rolling and I would jump in with MB & Peter. We piled in their Subaru – four wheel drive with snow chains on the tires, of course – and followed along behind. MB, Peter and I were feeling pretty good about our pushing strength until we came around the corner and saw a very steep hill ahead of us with one black VW Jetta wagon stuck in the middle. Again, we piled out of the Subaru to see what could be done. The road was wide at this point so this time we pushed the Jetta to the side of the road, not up it. MB & Peter decided they would drive by us and see how far it was to the mountain pass where the others had parked. Greg and I were to wait in the VW while they scouted out the rest of the road. If it was close, they would walk back to get us. If it was far, they would drive back to pick us up. It seemed Jetta would miss the tree hunt but we would get to participate. Greg and I sat in the car with the heat on, pleased that we had filled up the tank before we left but sheepish that we had not thought to buy snow chains for the car. We live in the land of rain, for gods sake, not snow! At least there was a good radio show on for us to listen to while we waited. The snow was really coming down now and the wind was blowing good. With all the snow swirling around us I felt like we were in a snow globe that had been vigorously shaken up, that is, if there exists is a snow globe featuring a stuck black Jetta as it’s holiday scene. After a bit we saw four figures coming down the hill but we couldn’t make out whom they were though the thick falling snow. As they drew closer we could see that it wasn’t MB & Peter but four of the other shipwrights. Fresh Horses! We were less than a quarter of a mile from the pass where the others had gathered. As the four Horses and I pushed the wheels spun and suddenly the tires grabbed the road and off Greg went again to be lost behind a curtain of blizzard like snow and the turn in the road ahead of us. The Horses and I tromped up the hill to the pass and with relief saw a Jetta parked, not stuck, beside all the cars, trucks and SUVs of others who had made a better choice as to what set of wheels they would take on the tree slaying expedition. The Horses asked why a girl from Maine let a South African drive in the snow? They had never seen Greg’s road rally style driving in a South African game park on a treacherous, pothole filled road – a washed out, mud slick course at best. As we grew closer to the top, we could hear the roar of a good old fashioned pallet fire and muffled voices of people clad in thick coats and boots, disguised by hats and scarves. Back in the day, there was a lot sipping from flasks and tipping back of beers around the fire. Now most of the crew have families so there is more hot coco and cider consumed. Well, there were a few flasks making the circuit around the fire but not with the vigor and speed of the B.C. days – before children! In addition to children, a tailgate lunch is also new to the event as mothers know children need food to keep them from whining. Greg uses this very same food tactic to keep me happy so he made sure to bring me a big bowl of chili. The other wives thought he was being so thoughtful, why didn’t their men do this for them? But I know it was just selfdefense on Greg’s part. Clever man! Kids were making snow angels, careening down the road on sleds and the snow kept on falling. How much so far? I poked my gloved hand into the snow to find it halfway up my forearm. This was a proper snowstorm! The surprise in the weather was exciting as I dearly miss snow but in the back of my mind I was wondering if Jetta would be stuck on the pass until the spring thaw. After libations, big stories and bowls of chili people headed out in all directions of the compass to find the perfect tree. We found a lopsided little tree with lots of character, chopped it down and brought it home. By now the snow was drifting but I am quite sure there was a foot on the ground when we loaded up the tree for the drive home. The trip down the mountain was without event as momentum was on our side and we were at the front of the line of cars, able to find fresh snow that offered traction. Sadly, my husband Greg’s dad Martin passed in his sleep last Saturday night after battling cancer for the last ten months. We are all relieved that it was a peaceful wrap on a fully lived life. On Friday, when Greg and I heard that it was getting close, we secured our fishing boat Duna in a slip and flew out of Sitka to Seattle. Greg then headed to South Africa to be with his mom and sisters. My role was to return to Port Townsend for a few weeks on standby for whatever needed doing. I am so glad Greg flew to South Africa as with his family is where he should be right now, him supporting them and them supporting him. All will be fine with time and the Friedrichs clan knows the value and healing power of laughter through tears. We are playing it by ear on our return to Alaska and fishing. 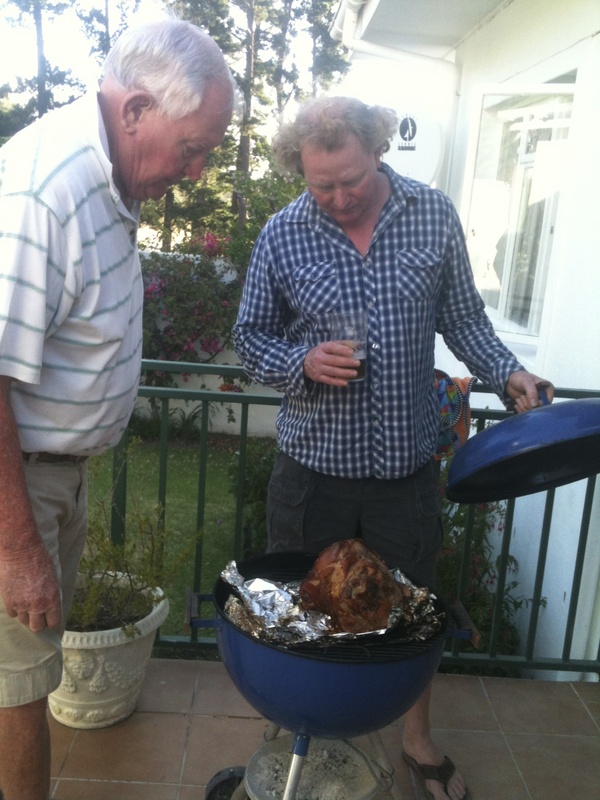 In theory, we hope to be on the water again by July 15th but will see how it all goes in South Africa. If need be Greg will stay on longer to help his family. That is the good thing about running your own business, the flexibility when you need it. My goofy old hound dog is beside himself with joy that he has me back to cater to his need for scratches and walks in the woods and field. The gardens are also breathing a sigh of relief for my return, as it has been hot and dry here in the Pacific Northwest. The grass is good and brown and that is how it will stay. No water for the lawn as I hate mowing that damn grass! It is full blown summer in Port Townsend. In spite of and maybe because of the heat, the raspberries in my backyard and wild blackberries in the fields are ripe and adding up in our freezer. The berries joined 20 pounds of sweet, red cherries – pitted, frozen on sheet pans and transferred to containers – stacked in the deep freeze earlier in June. Blueberries are sure to be early due to the summery blast so soon it will be a trip to Finnriver Farm and Cidery in Chimacum for U-pick. Unlike the wild blackberries that are found low in the grass on thorny canes that stitch exposed limbs with a mesh of red welts, the task of picking high bush blueberries is painless work. For now, off the boat and out of Alaska, my focus has shifted from producing seafood to putting up landfood. Part of me feels badly to be in the middle of all this summer with bounty and bloom, the smell of fresh hay everywhere and doors of the house propped wide open for breezes while Greg is taking his last journey with his father. My friend and dog sitter Josh wisely said, “You can feel bad about enjoying your sudden summertime at home but it won’t do him or you any good.” He is right. So I am collecting summer to share with Greg when he gets back – berries in the freezer, pictures from the woodsy walks and writing him quick messages that hopefully steal him away from the sadness for a few seconds when he reads them. 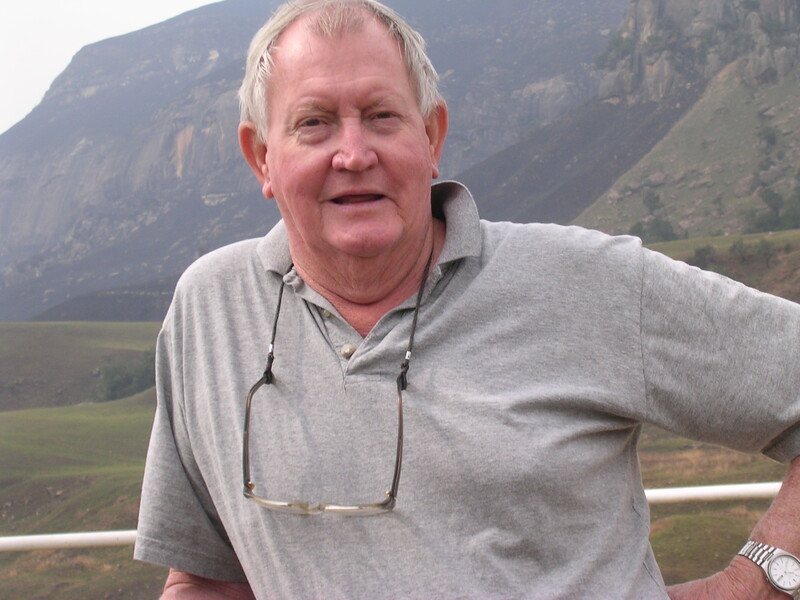 We have a good life and it was a good life that Martin Friedrichs shared with his family and friends. And it’s a good life I get to share with all of you. Thank you for being there as my family and friends. 2015 Washington Chinook salmon fishing opened May 1st – Where to buy the fish? As sure as any harbinger of spring the return of Chinook salmon to our coastal waters signals we are on our way to warmer weather and longer days. Friday, May 1st marked the opening of the 2015 Washington commercial troll fishery for Chinook. 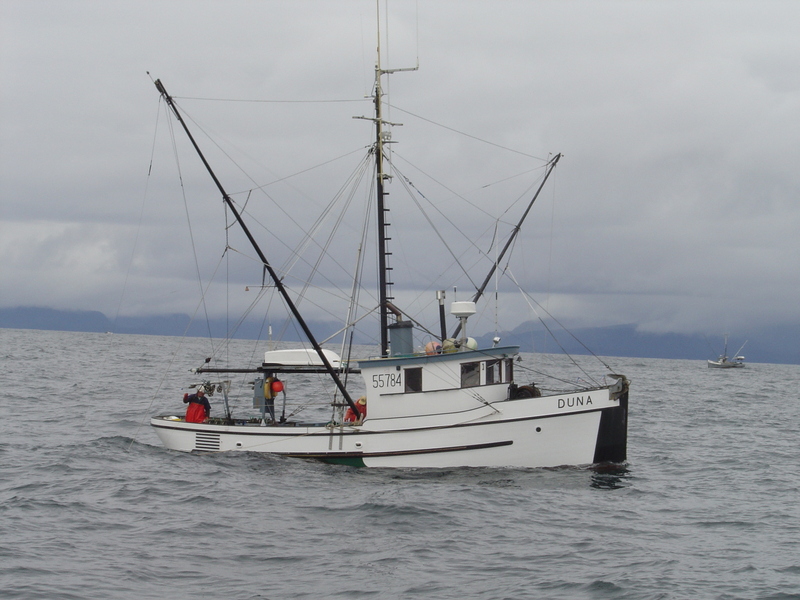 The fishing boats are on the water and soon will be returning to the dock with silver backed salmon securely tucked into icy fish holds. So begins the 2015 fishing season and the availability of fresh, local wild Chinook. If you are a chef or just love fresh caught Chinook you must be anticipating the chance to get your first taste of this year’s Washington hook and line caught salmon. What better seafood can you think of to accompany the tender shoots of landfood that are showing up in your kitchen? Briny and sweet, rich yet mild, Washington troll caught Chinook will shine when it shares the spotlight with the springtime bounty of produce. Trolling, also know as hook and line fishing, is widely recognized as one of the most sustainable ways to catch fish. Washington Chinook are caught less than 200 miles from Seattle and never get on a plane so these fish have a smaller carbon footprint. 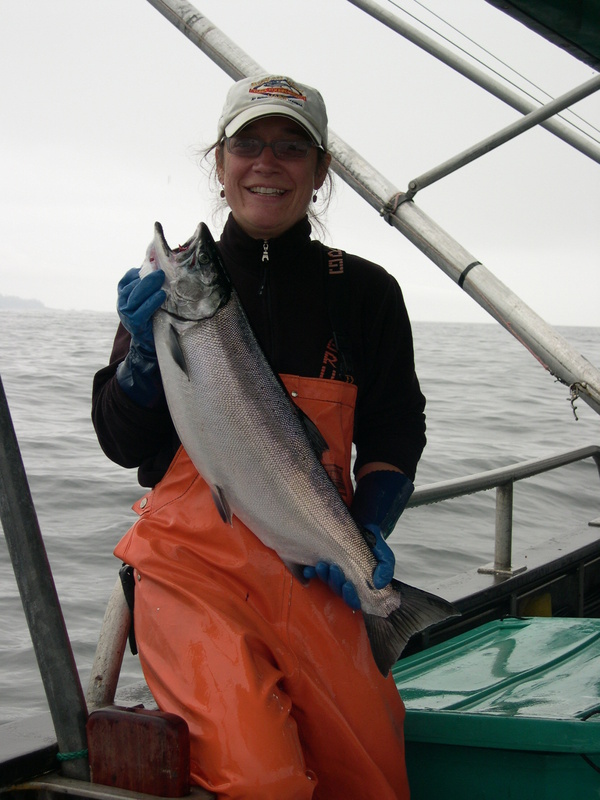 Buying locally caught Chinook supports Washington’s fishing families and businesses. Keeping it local never tasted so good. 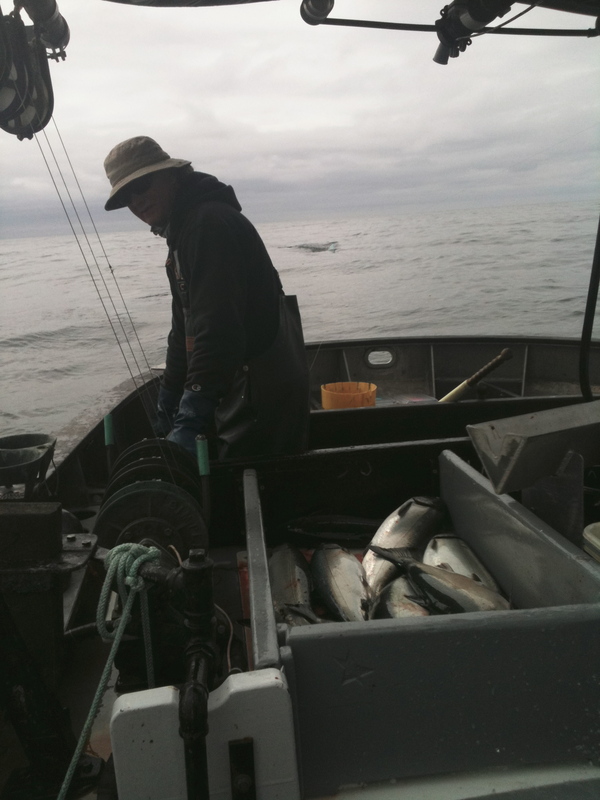 You may be thinking, “Where can I buy the fish?” Here is a list of fishermen and seafood distributors who will be able to supply your restaurant or market with fresh troll caught Washington Chinook. When you order, make sure to ask your fishmonger what color Chinook is available. Whether red, white or marbled all Washington Chinook are delicious and add local flavor to your menu or seafood counter selection. Businesses marked with an asterisk are owned by fishermen who sell their own catch. Notes: SMS preferred contact method, in season, by appointment. Delivering direct to select restaurants and seafood markets in North Sound area. Notes: Wild Salmon Seafood Market retail store has a sizable wholesale business. Delivery to Queen Anne, Magnolia and Ballard restaurants, always available for will call. FedEx shipping around the country. If you have never worked on a fishing boat you may find it odd but there is nothing more comforting than the faint smell of diesel. I was reminded of this as I swung back the door and stepped into the wheelhouse of tugboat Newt, scented strongly by fir with a hint of diesel. It was February and I had just suffered another of the east to west coast returns that punctuate the work I do in the off season to support my commercial fishing habit. The day was tormented by delayed flights, missed connections and the realization that I would not get to Seattle in time to make the last ferry to Port Townsend and home. A call made from Newark, New Jersey secured me a bunk on a 70-foot wooden tugboat in Seattle for the night. Well past midnight came the relief of unfurling the sleeping bag that is always on standby in the back of my car in a warm west coast wheelhouse, floating instead of flying. The smell of a diesel powered wooden boat is something you cannot shake once you have stepped foot on one. Its warm breath permeates your nose, clothes and memory. The combination of wood and diesel is a different perfume. This is not the smell of diesel vapor that rises from a deck fitting as you nervously fill the boat’s tank at Petro Marine. Not the acrid scent that creeps closer to your nose while you eyeball the level of the tank through the crescent space left between the nozzle of the hose and the wall of the fuel fill fitting. You tune your ear to the sound of free flowing fuel that will change to gurgling foam threatening to gush on to the deck just before the tank is full. The sound of free flow is trance inducing and like a genie from a bottle random thoughts waft up on the vapors, lulling you to another place until you jerk back to the present for fear of over flow. Nor is it the smell left on your hands after you pick up the fuel spattered diaper once the danger of over flow has been narrowly averted by your trigger finger quick reaction to the slightly hollow sound that lies between free flow and the gurgle of full. Another trip to the fuel dock completed without a rainbow sheen of shame surrounding your boat like a slipped halo. And it’s not the hot smell of steel, leaked oil and diesel exhaust that hits you as the engine room door slides back on its pocket track. That wall of air is just as thick as the door you just opened. Stepping into it is done gingerly while eyes quickly assess belts, gages, Racor filters and shaft for anything loose, leaky or not dripping enough. Back out of that room respectfully as it has been said to you, “Never turn your back on a moving engine.” Close the door on the raucous din of another event free engine room check. Seal in the good fortune of this place specific stink that keeps parts turning freely and water gliding by your hull. Feel lucky as you skip up the ladder for the hard working smell you just left has been known to cause some bellies to boil if the sea is thrashing and your boat is bucking through rather than riding with the waves. The comfort scent I am recalling is salty and slightly sweet, a combination of past trips, cedar planks and the sweat of hard work. It is a lingering smell that for those of you who do not know could be best described as pipe tobacco when it is sparked but not fully lit, the sulfur from the match and the resulting smoke rounding out the leathery bouquet. It is a smell that for days on end scents your waking hours, tea breaks and dreamless sleeps when the deck work has battered you just enough to hurt but not break you. It greets you as eyes flutter to the sound of the 671 alarm clock or maybe yours is a Deere John. 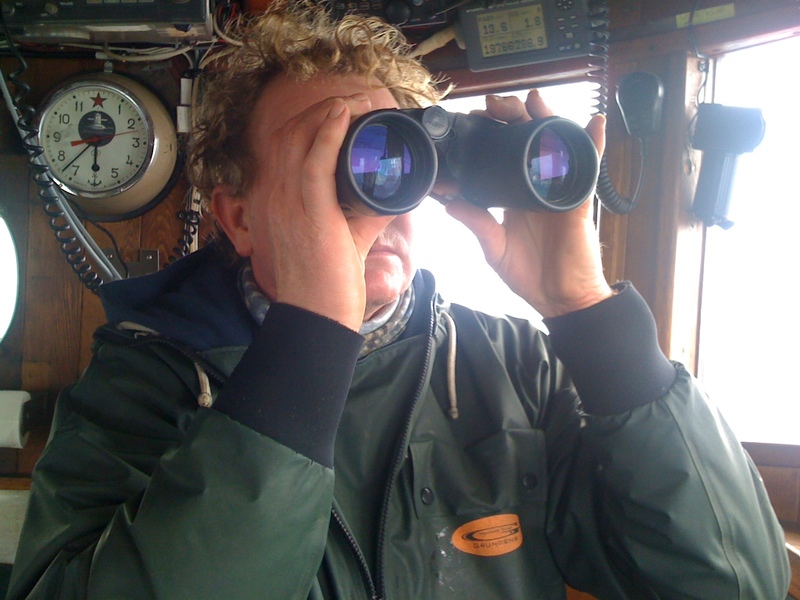 In any case, your good skipper has the coffee on, it’s own aroma a consolation prize for the push out of your down filled nest as you fledge for another day of fishing. Diesel perfume is a smell you eventually wash from your clothes after a few weeks back on land when season is done but one that never leaves you. It will summon all of Alaska back to the surface when on a dark night it unexpectedly greets you at the wheelhouse door in Seattle.